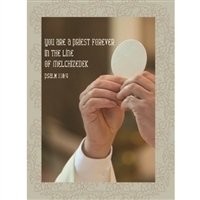 This card is designed for multiple use - Ordination, Anniversary or Appreciation. 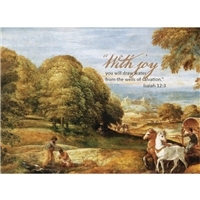 Masculine, simple design and depth of meaning - this card will be appreciated by a shepherd of God's people. Back of the card includes the poem "Beautiful Hands of a Priest." Size of card is 4.25 x 6.25 inches and comes with white envelope. Greeting card with St. Stephen. Intended for deacons, transitional deacons, priests, pastors, ministers. 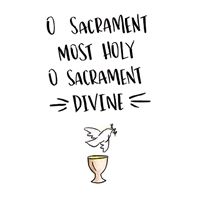 Use for ordination, congratulations, anniversary, birthday or gratitude. Inside "May the grace of the Holy Spirit configure you to Christ as you proclaim the Gospel and fulfill your ministry." The back of the card features a selection from Acts 6; the choosing of Stephen and the other deacons. Card size 4x6 inches. Made in the USA using recycled paper. Comes with white envelope.